Please note that the content of this book primarily consists of articles available from Wikipedia or other free sources online. 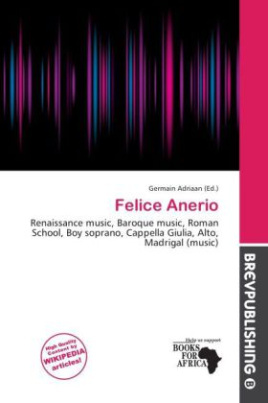 Felice Anerio was an Italian composer of the late Renaissance and early Baroque eras, and a member of the Roman School of composers. He was the older brother of another important, and somewhat more progressive composer of the same period, Giovanni Francesco Anerio. Anerio was born in Rome and lived his entire life there. He sang as a boy soprano at the Julian Chapel from 1568 until 1577, and then he sang at another church until 1580. Around this time he began to compose, especially madrigals; this was one of the few periods in his life during which he wrote secular music.